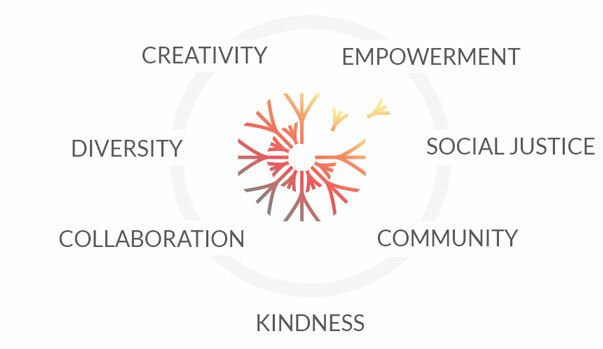 We envision a world in which all young people lead creative, purposeful lives. 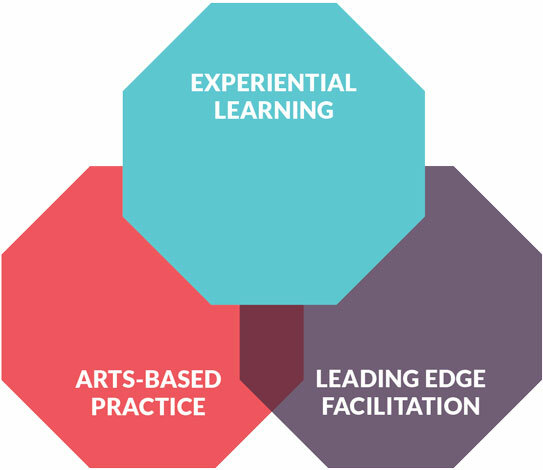 The Creative Empowerment Model combines EXPERIENTIAL LEARNING, GROUP FACILITATION and ARTS-BASED PRACTICE into a framework for designing and leading transformative programs for youth and adults. Participants develop self-confidence, motivation, social and emotional competence, and leadership – proven predictors of well-being. Hover or click over the diagram to read more about each practice. People thrive in arts-rich environments. Easy-to-lead activities drawn from art forms like poetry, visual arts, music, and theater to boost bonding and creativity, build motivation, and bring joy into learning. Hands-on experience sparks new perspectives. Participation and reflection ignite possibility, offer insight, and transform attitudes, behaviors, and beliefs. Social and empathetic growth happens best in well-facilitated groups. The most current techniques in leadership and group dynamics prepare practitioners to build great groups. Increasing the strength and confidence to enact the life we envision for ourselves, our communities, and the world. 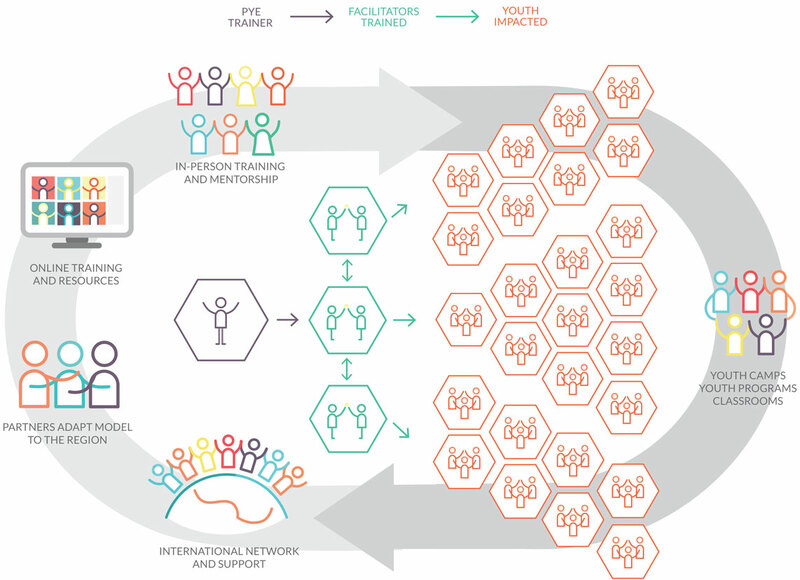 We achieve exponential impact by working with individuals and organizations that work directly with youth. We develop partnerships with local organizations and schools who adapt and spread the Creative Empowerment Model in their own work. This leads to a multiplier effect that increases impact. Deepa specializes in policy, program design and evaluation based on people’s perspectives. She has a Phd in Child Development and frames her work through a lense of power and inequality. She was Senior Advisor on poverty reduction at the World Bank from 2003-2008. She has served on expert advisory groups of international organizations and NGOs including the World Economic Forum, the Global Development Network and Dasra. Her books include the Voices of the Poor and the four-volume Moving Out of Poverty series. Her new book Chup: Breaking the Silence About India’s Women focuses on the power of culture and habits in explaining deep gender inequality in India with implications for the women’s movement in India and the USA. Ian is co-founder of Partners for Youth Empowerment and Board Chair. He is also a co-founder of IndigenEYEZ. He has previously been the Chair of a number of charities including the Institute of Noetic Sciences and the Global Board of The Hunger Project. Ian’s daughter Lucinda participated in Power of Hope camps on Cortes Island BC. He is an investor and runs a family office. Gwyn is a social entrepreneur who has decades’ experience launching, delivering, and funding creative initiatives that prepare young people to succeed in school, work, and life. After starting her career in international development, Gwyn discovered a deep passion for the social impact of the arts which has become the focus of her work ever since. In addition to her role as our Executive Director, Gwyn serves on the advisory board of Ashoka Changemaker Schools and on the steering committee of IndigenEYEZ, an organization that brings the Creative Empowerment Model to First Nations communities in British Columbia, Canada. She holds a B.A. in Political Science (Hons) from McGill University and a Master’s of International Affairs from Columbia University in New York. Gwyn is originally from Canada and lived many years in Colombia and the UK before moving with her family to Barcelona, Spain. In her spare time Gwyn loves photography, cooking, music, and spending time by the sea. Helena is a chemical engineer turned social entrepreneur who brings over 15 years of experience developing and managing programs for volunteers, non-profits, and businesses. She has a BS in Chemical Engineering from the University of Michigan and a Masters in International Administration with a focus on finance and marketing. Helena is in charge of all aspects of our North American programs including fundraising, partners, and new business. She has great rapport with youth and families and is passionate about her work directing our Whidbey Island Power of Hope Youth camp and developing the network of organizations that provide Creative Empowerment Camps for youth around the world. Peggy is a writer, musician, and creative development specialist with a passion for helping people connect with their innate creativity. Her Masters of Education in Creative Arts in Learning from Lesley University in Cambridge, MA, USA inspired her to enter the field of creative empowerment for youth. Peggy has over 30 years of experience working in the fields of group facilitation and experiential learning. She is co-author of Catch the Fire: An Art-Full Guide to Unleashing the Creative Power of Youth, Adults and Communities and the bestselling Chop Wood, Carry Water: A Guide to Finding Spiritual Fulfillment in Everyday Life. She has co-founded several social purpose business and non-profits including Partners for Youth Empowerment, Power of Hope: Youth Empowerment through the Arts, and Young Women Empowered. Peggy is a writer, musician, and creative development specialist with a passion for helping people connect with their innate creativity. Her Masters of Education in Creative Arts in Learning from Lesley University in Cambridge, MA, USA inspired her to enter the field of creative empowerment for youth. Peggy has over 30 years of experience working in the fields of group facilitation and experiential learning. She is co-author of Catch the Fire: An Art-Full Guide to Unleashing the Creative Power of Youth, Adults and Communities and the bestselling Chop Wood, Carry Water: A Guide to Finding Spiritual Fulfillment in Everyday Life. She has co-founded several social purpose businesses and non-profits including Partners for Youth Empowerment, Power of Hope: Youth Empowerment through the Arts, and Young Women Empowered. Thomas hails from Kirkland, Washington, and loves music, theater, dance, and all forms of liberation. He has worked extensively with the Creative Empowerment Model both at Power of Hope Camps and as a theater teaching artist in schools in the San Francisco Bay Area. In 2015, he co-founded Left Bass, a global music dance party fundraiser, supporting organizing efforts for racial and economic justice in Oakland, California. His mission is to help groups and individuals move beyond barriers to connect deeply with their internal lives, each other, and the world around them. Madhu is a theatre-based facilitator and founder of Playspace, a Bangalore-based organization that offers theatre-based learning experiences for groups, communities, and organisations. She is passionate about the power of theatre and the creative arts to promote personal transformation, change, and authentic leadership in organisations. She is trained in applied theatre methodologies like Psychodrama, Theatre of the Oppressed, Playback Theatre and Improvisational Theatre. She runs a storytelling intiative for adults called By The River to connect with the power and healing in sharing of stories, and is a member of the Improv Comedy Bangalore ensemble. Claudia Pineda, MSW, works with youth and families involved with the justice system. She surrounds social justice with a focus on racial, gender, economic, and sexual equity. Since 2014, when she first became involved in PYE Global and the Creative Community Model, her life has been transformed. She now connects the Creative Community Model with people who are socially marginalized and seek empowerment. Claudia has been inspired by the healing and transformation she has witnessed her participants experience. Melanie (Colombia, Guatemala, Canada) is a social artist known for her participatory mobile murals. She invites individuals, communities, and institutions to work together on specific social issues by creating public art through collaboratively participatory formats. With a BFA in visual arts and other trainings in arts therapeutics, she has engaged more than 1500 people in creating mobile murals, and facilitated more than 1000 workshops on creativity, belonging and self-discovery to diverse populations. Peter is a co-founder and Chair of the Canadian-based Somerset Foundation whose mission is to support social innovation and wellbeing. He has engaged with several social purpose organizations, including the Wellbeing Project and is a member of the global Ashoka Support Network. In the late 1980’s, Peter pursued securities training through the Canadian Securities Institute. Since then, he has been involved in private business, financial ventures and social enterprises. In 2008 he retired from a 25 year career as a medical doctor and specialist at the University of British Columbia. Peter’s interests include supporting the structure, governance and strategy of social purpose organizations so that they may successfully live their missions. He and his wife Nancy live in Vancouver and Naramata BC and have four wonderful daughters. Themis founded the educational organization Flow Athens to give form to the way he imagines inspiring learning. He experimented with teaching and developed a sense for education early on, by growing up and working at the private school founded by his grandmother. He studied Mechanical Engineering at NTUA, and later delved into human psychology through additional Pedagogical studies. He then obtained an MBA with distinction from INSEAD. After a long journey of career exploration, he is back to where it all began: developing initiatives for meaningful education to meet the changing needs of people. Julia Pond is a dance artist and facilitator living in London. She has worked with the Creative Empowerment Model since 2009. She has a particular interest in contemplative practice and the arts. She is a founding member of the Art Monastery Project, where she developed and delivered a number of workshops fusing movement and contemplative practice. Julia continues performance and choreography work, both freelance and with her ensemble Duncan Dance Project. To keep things spicy, she teaches a bit of yoga and leads editorial content for Skyscanner. Khari was born and raised in Detroit and currently resides in Vancouver, BC. It was over a decade ago in the Pacific Northwest where he began his journey learning from and working with internationally renowned facilitators and artists. His passion for being of service to communities is clear, both in his musical life and in his facilitation work. Khari balances his time each year performing and working with communities as a facilitator. He has worked throughout Canada and internationally in Australia, The United States, The United Kingdom, Jamaica and Uganda. Devin Majkut is an advocate, facilitator, youth worker, social worker, and activist who is consistently finding ways to bring her love for creativity into her work. She works for multiple non-profits in the Seattle area, and seeks to give herself wholly to the people, communities, and causes that she is a part of. Devin is a mental health and chemical dependency professional who received her Masters in Social Work from the University of Washington. Devin is the Social Worker in Residence at Young Women Empowered in Seattle, WA and provides risk management and social work consultation to Partners for Youth Empowerment programs. Stephanie is an interdisciplinary artist, performer and Creative Empowerment facilitator. She has over 10 years experience facilitating in a variety of settings in London, across the UK and internationally. The focus of her work is on youth engagement particularly with minority groups. She is currently project coordinator for Amy’s Yard at the Amy Winehouse Foundation, where she supports 16 emerging artists through a robust program of artistic development. She recently designed and delivered “Skip to the Beat” a new 12-week program for the Young Urban Arts Foundation that targets young people suffering with an array of mental health challenges to support them to manage and improve their mental well being. Devon works as a facilitator, trainer and mediator guided by the values of community, social justice and dignity. She has designed, facilitated, and managed experiential-learning programs for numerous organizations in the US and abroad. She works with groups and teams and also offers training and consultation for educators, team leaders, and other social service professionals. Devon currently teaches “Education as Empowerment” for the University of Washington’s Pipeline Project. Devon holds a BA in Sociology and a Graduate Certificate in Restorative Justice and is currently pursuing a Masters in Social Work. Her long-time studies in the arts inspire her to use artistic mediums to help participants cultivate personal awareness, effective communication, and leadership skills. Charles is President of Terry-MacGregor Associates, a consulting group in Langley, WA, US. 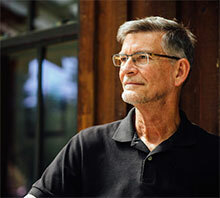 He has 40 years experience advising philanthropists, foundations, and NGO’s. He served as Director of Philanthropy for the Rockefeller Family Office and Rockefeller Financial Services in New York City and as President of The Philanthropic Collaborative. He was founder, co-founder, founding board member and/or a core developer of a number of organizations which have pioneered new approaches and been widely seen as models, including The Door, a multiservice center for teenagers in NYC; the NYU Law School Program in Urban Law; Guidestar, Inc., “the world’s largest source of information on nonprofit organizations”; The Bravewell Collaborative for Integrative Medicine; Enso House, a hospice home on Whidbey Island, and others. His current artistic passion is digital photography, particularly documenting the lives of children around the world. Rup is an interdisciplinary artist and facilitator residing on unceded Coast Salish Territories, Vancouver, BC. Rup’s work meets at the intersection of social justice and the arts. He has created and led hundreds of programs and trainings with youth and adults around the globe. He leads programs with the Access to Media Education Society, Power of Hope, Reel Youth, the Sarah McLachlan School of Music, plus more. Rup co-founded Metaphor, a program dedicated to bringing hip hop workshops and performances into schools, detention centers, and rural communities across Turtle Island. Marta is a highly skilled “lightning rod” who connects individuals form diverse backgrounds looking to find common ground. After a 20 year career in senior private banking roles in Paris, London and Hong Kong, she became a senior business development strategist for two leading professional services firms with international expansion in mind. In 2010, she founded her own Zurich-based consultancy firm working primarily in the family office sector on behalf of clients and families in various corners of the globe. In 2013 she moved her practice to London where she currently resides. Marta is passionate about education and, in particular, extending both the aspirational and practical reach of young people in challenging circumstances. She has been instrumental in bringing First Star Academies to the UK, a four-year university access programme for foster teens. Adam is the Founder and CEO of LATE NITE ART®, a creative experience lab that drives innovation and builds empathy inside of companies and institutions. 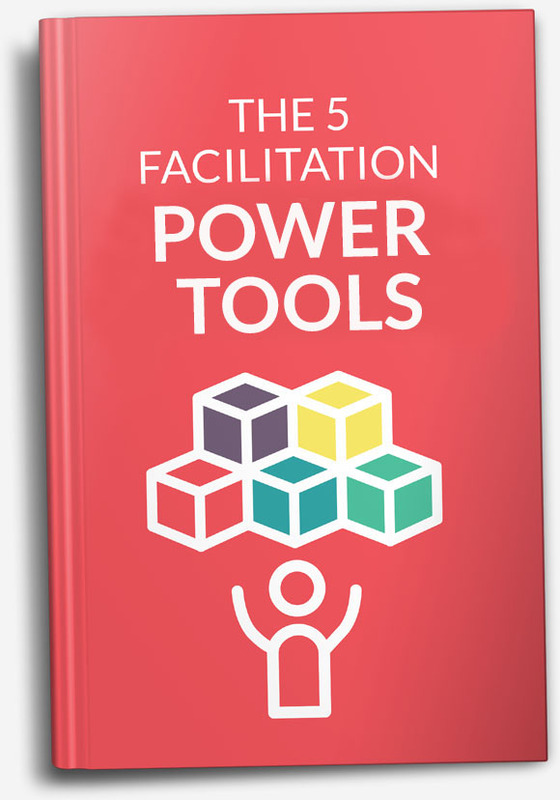 As a facilitator, he trains leaders to become more adaptive, connected, and creative. As an experience designer, he creates learning spaces that help his clients shift their team’s culture, and break routine ways of thinking. His clients include universities and schools across the US, Instagram, Google, the Mexico Tourism Board, and the US Probation Office. Reid Kuennen believes our communities crave the normalization and celebration of non-dominant identities through the power of storytelling. An experienced filmmaker, Reid focuses her efforts on teaching the next generation of filmmakers and using video as a resistance tool. As a mentor/instructor, Reid works to cultivate safer, collaborative spaces where we build one another up to be our most creative, clever, and courageous selves. Grace works with the Centre for Creativity and Capacity Development to facilitate team building, university student orientations, youth camps, and strategic planning sessions with organizations like Ashoka Africa, Peace Corps Uganda, Windle International Uganda, and Friends’ Consult among others. She is an arts educator, who works passionately with dance/movement and all the other performance arts as tools for transformation. She was stage manager and dance/movement choreographer for the famed Silent Voices Uganda, a female-founded theatre company that tackles controversial social issues. She is Assistant Director-Uganda of the NYU Dance Study Abroad exchange program, Assistant Artist Director of Okulamba Dance Theater Company, and Artist Consultant with House of Talent East Africa. Thandile is the founder of Goof Edutainment, a Cape Town organization that brings creative facilitation to youth and adults. He is also a Non-Executive Director of Bright Sparks, which helps teachers use creativity to enliven their classrooms. He has a certificate in Child and Youth Care Work with the National Association for Child Care Workers and has done extensive formal training in community development and facilitation. These include Emotional Intelligence with EQ Proficiency, Partners for Youth Empowerment Creative Facilitation, and Art of Facilitation with Ilka Stein Consultancy. Thandile designs and facilitates youth camps and programs and teambuilding for staff. He trains and mentors facilitators using the Creative Empowerment Model. Mary lives in Uganda, where she has spent more than 20 years as a professional English language and literature teacher in secondary school. Due to her desire to see youth grow into their creative power, she works with a variety of youth camps around Uganda. Alan Wong is a facilitator and poet who has dedicated his life to helping youth, educators, and communities grow. He is the former Program Director and lead facilitator at Power of Hope and founder of Alan Wong: Facilitation and Training. Over the last 15 years, Alan has led trainings for educators throughout the US, and internationally in India, Korea, Canada, Brazil, Myanmar, Ecuador, and Thailand. His ultimate goal is to help build healthy, connected communities where every individual is treated with dignity and respect, and has the opportunity to realize their full potential. Mari is committed to creative empowerment, specifically, with young people. After studying contemporary painting at Gage Academy for three years in one of their Atelier programs, she is now an instructor for the teen programs at Gage. In addition to fine art instruction, she facilitates and works with Partners of Youth Empowerment to empower young people through creativity. Brigid Tierney is a fiery Montrealer turned West Coast dreamer turned Toronto transplant. She has been working in the creative facilitation community in many capacities and found a profound connection and hard-to-name feeling in the air that has grown louder and more beautiful ever since. She has a Master’s in cultural studies and communication, likes to fight the good fight, and works at the intersection of film, community, justice, and youth engagement. Voula was born in Greece and lived in Canada as an immigrant for many years. This experience shaped her compassion for immigrants and refugees. She has a BSc in research psychology from the University of Toronto and an MA in education psychology. Returning to Greece, she started working with children with learning differences and counselling their families. Subsequently, she trained in human rights education, peace education, and drama in education and realized the power of the arts in addressing social issues. Her aim is to assist students and teachers become aware of social and environmental issues, while developing their critical thinking and empathy. Two years ago, she co-designed and coordinated in Athens a non-formal education program for 200 refugee children aged 6 to 12. Claire was born in Canada and considers herself part of the social fabric of South Africa, since making it her home in 2012. She has a background in Anthropology and Gender Studies and is passionate about exploring our collective humanity. Claire works from the heart to hold safer spaces for individual and collective creativity and personal development. Since 2016, she has been actively training as a Wellness Practitioner in integrative trauma healing modalities. She brings this training to the Creative Empowerment Model through reflective, meditative, and process-oriented arts-based experiences at camp, and by creating a fun and supportive atmosphere in trainings. Claire is committed to creating more accessible spaces for transformation and growth across South Africa. Sara brings 20 years of facilitation work to the design and delivery of group learning experiences. Her facilitation style awakens courage, care, and creativity, ever focused on justice and the nourishing of individual and collective health while having a fantastic time. Her personal artistic background comes from circus arts, performance poetry, hip hop music, and the leadership of community choirs. Her work is infused with the brilliant skill sets of the artists she has been fortunate enough to collaborate with in youth empowerment work across nations and over the years. Sara is a professional paramedic now living in Havana, Cuba where she studies medicine. Kelly has a contagious laugh and a passion for the power of community. She is co-founder and director of IndigenEYEZ. She is known in First Nations throughout BC for her inspiring workshops on everything from team building to strategic planning to effective leadership. As a person of mixed heritage, Kelly has been bridging distinct worlds all her life, learning to weave together the strengths of her Syilx and European ancestry. The proud mother of two beautiful young women, Madeline and Sophia, Kelly lives in her family’s ancestral home in the south Okanagan. Herman is a Ugandan artistic consultant, creative facilitator, and performer with over 12 years experience working with classical and East African music, dance, and drama to support youth development initiatives. Herman currently works with the Centre for Creativity and Capacity Building, where he builds a capacity of facilitators, artists and professionals through creative group facilitation and interactive team building activities. Outside of work he enjoys watching football, listening to and making music, traveling, and regularly performing as a tenor with his church choir. Ed Wade-Martins is a creative facilitator, musician, sailor, carpenter, dreamer, adventurer and mentor from the UK. Ed has been leading creative workshops and facilitating groups of adults, children and teenagers for nearly 20 years in all sorts of settings. He leads international trainings with PYE Global across Europe and Africa. In addition, he is a founder and co-director of Movingsounds, an arts organization based on the belief that we really can bring about positive change through working with the creative arts. Nuff works as VP at the Canada Research Center whose mission is to engage and integrate Society, Governance, Technology and Industry. He recently presented as keynote speaker for CRC on Business Automation and Education 4.0 at Oxford University. He was previously a global dean at Dean-Hult International Business School, and is currently a visiting professor at a number of universities and business schools. He holds a Bachelor Degree in Economics; a Master’s of Arts in International Relations; and a PhD in Strategy, Operations, Leadership and Organisational Behaviour. Mona grew up in the West Bank of Luxor, Egypt. In 2001, she received a degree in Islamic Studies from Al-Azhar University and worked as a teacher in local schools and nurseries for over 10 years. Mona joined the Elisa Sednaoui Foundation’s Funtasia Team in 2015, having led several youth workshops alongside national and international artists and creatives and numerous classes in Funtasia’s educational after-school programs for young people. Mona became a Creative Facilitation trainer in 2017, and has been leading trainings in cities across Egypt. Chungliang Al Huang is a philosopher, performing artist and internationally acclaimed Tao master. He is the Founder/President of the Living Tao Foundation and the international Lan Ting Institute located in the sacred mountains in China and on the Oregon Coast, USA. He is a research scholar of the Academia Sinica, a fellow of the World Academy of Art and Science, and an assembly member for the Council for A Parliament of the World Religions. A close colleague and collaborator with the late scholar Alan Watts and mythologist Joseph Campbell, Huang was featured in the inaugural segment of Bill Moyers’ renowned PBS “World of Ideas” series. Hanif is a nationally-recognized facilitator, trainer, speaker, and organizational development consultant with over 20 years of experience, expertise, and commitment to advancing equity and cultural competency. He is co-founder and Executive Director of the Center for Equity and Inclusion (CEI), an organization focused on advancing equity, diversity and inclusion efforts both locally and nationally. Prior to forming CEI, Hanif co-founded the Heart of Facilitation training with Partners for Youth Empowerment and has served as lead facilitator of the program for 14 years. Silvia is the founder of MovingInto. She is a creative facilitator, yoga teacher, and movement practitioner specializing in helping people and organisations access more creativity and wellbeing through embodied practices which draw upon the full range of our body’s intelligence. She is a senior facilitator for PYE where she has led workshops, trainings, and conferences around the globe with a diverse range of organisations. She has also led PYE’s Creative Learning initiative in the UK and has trained hundreds of teachers in PYE’s Creative Empowerment Model. Susan has a passion for life-long learning. She is a dynamic organizer who supports our events, registrations, and communications to ensure that our trainings happen uninterrupted. Prior to joining our team, she worked in higher education and non-profits for over 15 years where she supported adult learners as a career counselor, an academic advisor, a registrar, and a student services director. When she’s not behind the computer, you can find her enjoying the beach or the many local trails in the Pacific Northwest with her husband and two boys. Connie is a researcher and a former high school English teacher. She is passionate about preparing young people to live well together and build more caring, just, and sustainable communities. She has written about education for the 21st century, global citizenship, and community organizing. She works with a variety of education organizations on research, policy, strategy, and curriculum development. Her BA, EdM (Teaching & Curriculum, 1999 & International Education Policy, 2007), and doctorate are from Harvard University. She has been a foster parent to a 13-year-old boy for the past 3.5 years. Hatem began using the Creative Empowerment model in 2015 in Egypt, and he participated in the 2017 Imagination Power of Hope camp in Canada. Hatem’s key skills include his awareness, his ability to listen, and his passion for finding new activities that create connection between participants and improve the group dynamic. Hatem uses song, story, and poetry to build communities where everyone’s talents and gifts are acknowledged. Abdullah is a singer, songwriter, composer, producer, and a lead singer and guitarist in his Luxor-based folklore band, Acadia. He has a degree in Tourism and Hotel Management. He began working with Creative Empowerment Facilitation in 2015 and became a trainer in 2016. Abdullah has led numerous trainings for educators, artists and young professionals and has led multiple creative youth workshops. He combines his passion for music and his band tours with his creative facilitation work at the Funtasia Centre in Luxor’s West Bank. Xoli has been Teaching Environmental Education in primary schools for over a decade using the Creative Empowerment Model to encourage learners to care for, protect and take personal action toward themselves, the earth and others. She is now a teacher, mentor and facilitator. She founded Zithande Young Women’s Empowerment, which uses arts, ritual, dance and council circles to provide a conscious passage for girls as they move from childhood to adolescence. Her passion is to inspire health and a deep acceptance of self and others. Since 2014 she has been working with 5Rhythms Movement Meditation. She encourages those she works with to live from their hearts, listen to their intuition and trust their body’s wisdom. Nilisha Mohapatra is a facilitator, learning designer, and human development expert, who creates imaginative, inclusive learning spaces. She specializes in using experiential practices to build 21st century skills in young people and adults, around the globe. Be it working with non-profit teams, executives of Fortune 500 companies, youth from marginalized backgrounds, or teachers, Nilisha’s practice bridges the worlds of depth and play. An artist herself, she is passionate about helping people re-imagine their creativity. Nilisha believes that our resilience, imagination, and the ability to connect with each other, is what will help us thrive in this compelling world. Mutya Macatumpag is an interdisciplinary artist who interweaves music, movement, theatre and visual arts within her professional practice as a creator, performer, facilitator and event producer. She is enlivened by opportunities to explore authentic exchange, leadership, social justice, and people empowerment. Mutya has worked with a variety of intergenerational, intercultural and youth focused organizations across BC, Quebec and the US and hopes to continue on this path of collaborating, teaching, studying and performing on an International scale. For over 15 years, Aaron has worked to educate, empower, and entertain to youth and families around the world. He teaches chorus and drumming in Oregon and Washington through his 1 World Chorus, Young Audiences, and the Right Brain Initiative. Aaron also works with Ben & Jerry’s, The Bob Marley Foundation and Partners for Youth Empowerment to organize the One Love Youth Camp in Kingston, Jamaica. Living between Cortes Island, BC, Canada and London, UK, Victoria Watson is a board member of Hollyhock Lifelong Learning Centre in BC, Canada. She is a Life Director of the Institute of Noetic Sciences and was previously Vice-Chair and board member from 1985-2004. Prior to her marriage in 1980, she was one of the first women on the floor of Lloyd’s of London. Subsequently, she trained as a Psychosynthesis therapist. Rebekka believes in the power of the collective voice and regularly bears witness to the transformative magic that happens when people sing together. Trained as a singer, group facilitator and professional coach, Rebekka has spent over 15 years guiding individuals and groups in explorations of voice, creativity, and justice. She has worked in public, nonprofit, and education sectors designing and facilitating experiential workshops that inspire people to learn, deepen their relationships with others, and take action on the issues they care about. Rebekka leads vocal improvisation workshops throughout the country and directs the Seattle community choir, Path with Art Singers. Ruth is a master of working out systems to make our global organization work smoothly. Originally from the UK and now living in Barcelona, she speaks English and Spanish and wishes she could master Catalan. Ruth’s undergraduate degree in Political Science has led indirectly to a varied career in media, advertising, business development, startups, events planning, playgroups, and teaching. She’s good at finishing what she starts, and she prides herself on her multitasking and listening skills. Ruth loves life, the universe, and everything in it, but most specifically skiing, travel, people, and her kids. Vishal is co-founder of Dream a Dream, a charitable trust that uses a creative life skills approach to empower young people from vulnerable backgrounds. He is an Ashoka Fellow, an Eisenhower Fellow, and the Founder Director and currently an Advisor to Unltd India. Vishal believes that if we can re-imagine learning to develop empathy, creative thinking, problem solving, and collaborative working skills, young people will be able to overcome adversity and flourish in this fast-changing world. Donna is passionate about her community and has worked as a vounteer and staff member of several local organizations. She has experience in financial services and served for four years as treasurer of the board of the Wellington Day School where she spearheaded many fundraising events. Currently she volunteers at our local boxing gym supporting people living with Parkinson’s disease. Donna loves to travel and makes it a priority to explore the world with her husband and three children. Wayne Silby founded Calvert Funds, a $15 billion investment management group in Bethesda, MD, noted for its leadership in the area of socially responsible and impact investment. Mr. Silby also co-founded Social Venture Network, a group of socially oriented entrepreneurs and investors, and Calvert Social Venture Partners, one of the first socially oriented venture capital funds. He also started the Emerging Europe Fund for Sustainable Investment, a $60 million OPIC private equity fund focused on Central Europe. He was Founding Chair of Calvert Foundation (assets $300m) for 15 years and also Founding Chair of Impact Assets ($400m). He has a BS in Economics from the Wharton School of Finance at the University of Pennsylvania and a JD from the Georgetown University Law Center. Larry has over 30 years experience in banking and was a Managing Director with Citibank and Bank of America. He has a significant background in corporate finance, risk management and private banking, as well as project management, change management and people development. Larry is originally from Toronto, Canada and spent most of his career in New York and London. He now lives between Cape Cod and Barcelona. Larry was introduced to us through Marta Drummond and is passionate about working with youth. Ella is an award-winning multidisciplinary artist, filmmaker, creative facilitator, photographer, educator, and equity consultant based in Toronto. She holds a Masters of Arts in Education with extensive training in creative facilitation. She teaches at the University of Toronto and is the founder of Black Women Film! Canada. Ella’s work has been shown in galleries, public spaces, and film festivals across North America and Europe. Nancy is an educator, author and community builder. She is Dean of the Wellbeing Project, a global program supporting the inner wellness of social change leaders and demonstrating the intrinsic link between inner wellness and positive social impact. She was founding Executive Director of Goldie Hawn’s Bright Light Foundation in Canada and the US. Drawing on her 20-plus years of experience as an early childhood educator, she designed the research-based Mindfulness Education (ME) program that is now used in many schools across North America. Currently, she has a private practice teaching workshops on Mindfulness & Intimacy, is a member of the Ashoka Support Network, and Director of the Somerset Foundation. Cecilia is an Ashoka fellow and has been working with social projects since 1998. She spent nine years leading a Brazilian nonprofit focused on community-based tourism and founded Arteria, a social business that uses the Creative Empowerment model to develop the full potential of youth and teachers in Brazil. Cecilia loves to incorporate songs and dances from Brazilian native communities in her work. David has over 12 years experience in youth work, community development, and social entrepreneurship. He is a founder of the Center for Creativity and Capacity Building where he builds a capacity of facilitators, artists, and professionals through creative group facilitation and interactive team building activities. He worked with Deutsche Stiftung Weltbevoelkerung (DSW)-Uganda as the National Team Coordinator for Capacity Building and with the Ministry of Gender, Labour, and Social Development as the Youth Truck Coordinator. He also worked as the Country Director of In Movement: Art for Social Change. Advisor, consultant, and speaker to legacy families, family offices, and multigenerational enterprises, Peter’s primary engagements are long-term as a personne de confiance, helping legacy families sustain their family and business relationships for many generations. This work is in five areas: growing the human capital of the family by investing in the personal development of each individual and generation…the goal being happy, joyful, productive, contributive members of society, rather than entitled beneficiaries; building intellectual capital – a robust governance system, clear succession plans and successful decision-making; investing in the organization’s social capital – building traditions of civic contribution, family philanthropy, and maintaining social and political connections; fostering the development of the family’s spiritual capital; and finally, helping family members make choices to ensure wise stewardship of the financial capital of their enterprise. Gail recently retired from the World Bank Group where she worked for many years. Her initial assignments were in project finance in several regions, including a three year posting to Ghana. Gail also worked for a period in the Human Resources practice where she led the design of technical and leadership programs. Her final assignment was coordinating a program of open innovation in the World Bank Institute’s Innovation Lab. Gail holds an MBA from Queen’s University and has studied organization development at Pepperdine University. Hanan grew up in the West Bank of Luxor, Egypt. She dreams of making her community a better place, especially for young women. At 19, Hanan attended the Creative Facilitation Training and then joined the Elisa Sednaoui Foundation youth work team. Funtasia’s approach to youth, education, and teamwork inspired her with a new vision of the future. She hopes to plant the seed of artistic expression and empathy in children and younger generations, so that they have a better chance of achieving their dreams. Hanan has led several trainings and creative workshops with local and international artists in Luxor. Mark is a Managing Director at Ashoka, a global network of the world’s leading social entrepreneurs. Since 1980, Ashoka has supported more than 3,500 social innovators in over 80 countries. At Ashoka, Mark works with social innovators in diverse fields including micro-finance, healthcare, renewable energy, and education. Mark is passionate about helping young people develop the life skills to flourish. He has been a long-term supporter of several outstanding youth organizations, including LIFEbeat in the UK, where Mark volunteers as a workshop facilitator and youth mentor each year. Mark is based in Hong Kong and London. Maurits Schouten is a philanthopist and social impact investor who is passionate about helping social enterprises achieve their mission. He started his investment banking career in 1985 at ABN Amro in Amsterdam and moved to London in 1991 where he worked for Credit Suisse and Barclays as a Managing Director. After 23 years he left banking to focus on philanthropy and investing for his own account. He is a member of the Ashoka Support Network and In 2017 he co-founded Blue Parasol Investments to build a social impact investment portfolio. Maurits is married with two children and lives in Amsterdam. He has a PhD in economics from the University of Amsterdam. Soasis has worked for over two decades as a healing and social artist. She is a trained Holistic Health Practitioner, a certified teacher of the 5Rhythms movement meditation practice, and a facilitator and trainer with Power of Hope and IndigenEYEZ. She currently lives in Toronto, Canada on the the traditional territory of the Huron Wendat and Petun First Nations, the Seneca and the Mississaugas of the Credit River. She specializes in Sacredplay, a way of experiencing life with curiosity and a willingness to learn and improvise. Andrew Nalani is passionate about the design and evaluation of transformative educational programs that promote positive development in youth and adults. He has been involved with Partners for Youth Empowerment since 2012 as an international facilitator and lead-facilitator for the Power of Hope youth camp. He co-founded the African Youth Leadership Experience camp for youth from Uganda, Kenya, Rwanda and Tanzania based on the Creative Empowerment Model. Andrew has completed a Master of Education in Human Development and Psychology at Harvard, and is currently pursuing a PhD in Applied Psychology at Steinhardt School of Culture, Education and Human Development at New York University. Hailing from South Africa, Xola is the founder and director of Imithayelanga Youth Development, an organization that works with orphaned and vulnerable youth in rural areas. He’s practiced the Creative Community Model since 2010, and he’s been a leader of CF1, CF2 and camp, and co-facilitator of Art of Facilitation. Xola speaks English, Xhosa, Isizulu and Afrikaans. He currently lives in the Eastern Cape of South Africa, where he uses theatre as his primary art form, and integrates other arts through his facilitation. Gani is a filmmaker, storyteller, musician, and facilitator who creates inspiring documentary films. He particularly enjoys working with people and capturing real life moments of connection. Gani was introduced to the Creative Empowerment Model in 2011. He now works internationally with Partners for Youth Empowerment and a variety of other youth leadership groups. Raised in Cornwall, California, and Hawaii, Gani now lives in the rolling hills of Sussex, UK. Collaboration lies at the heart of our work. Our partners include schools, non-profit organizations, and businesses who share a commitment to unleashing the potential of youth. Our partners adapt the Creative Empowerment Model for maximum impact in their communities. The Bob Marley Foundation delivers social Interventions through Education, Culture, Healthcare and Sustainable Development while enacting lasting change with One Love, One Heart, One Voice. We have worked in partnership with the foundation and Ben & Jerry’s Ice Cream since 2015 to found and lead the One Love Youth Camp and provide creative facilitation training for Jamaican teachers, facilitators, and artists. 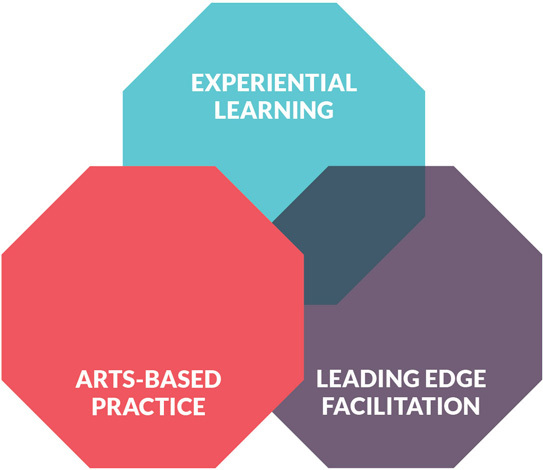 The Centre for Creativity and Capacity Development empowers individuals and communities to respond to their pressing challenges with creativity and resilience. The Centre provides Creative Facilitation Training for youth workers, teachers and organizations and works with international NGO’s like the US Peace Corps, to increase the impact of their youth programs. Culture Jam is a Creative Empowerment Camp sponsored by the Oregon Country Fair. With assistance from PYE, Culture Jam runs week-long camps each summer at the Oregon Country Fairgrounds and offers winter programs for youth and trainings for adults. Dream a Dream empowers children and young people from vulnerable backgrounds to overcome adversity and flourish in the 21st century using a creative life skills approach. In 2010 we stared a strategic partnership, training 0ver 200 staff and volunteers. Dream a Dream leads youth camps and a five-weekend teacher training based on the Creative Empowerment Model. Earthchild Project aims to inspire a new generation of healthy, confident and conscious young leaders through teaching practical life skills that complement the academic curriculum. Since 2015, we have provided design and training to Earthchild. They have been running residential camps for three years with the mentoring support from our international trainers. Elisa Sednauoi Foundation provides access to innovative, hands-on, creative learning experiences by offering a variety of after-school programs to children and youth, and professional development to adults. 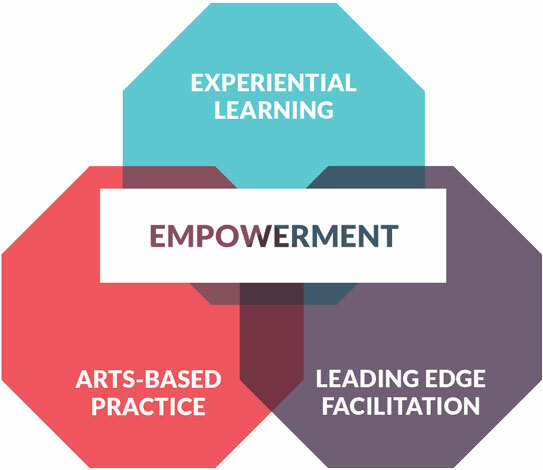 Since 2015 in Egypt and 2016 in Italy the foundation has used the framework of the Creative Empowerment Model to inform their project-based and hands-on learning programs. Flow Athens is an educational organization that designs and facilitates engaging learning experiences to foster life skills in adolescents and adults. Flow Athens delivers Creative Facilitation trainings for youth work practitioners and teachers throughout Greece. Goof Edutainment works with youth programs by hosting trainings, camps and leadership workshops. Their facilitators lead Creative Facilitation Trainings all over South Africa. They also host team-building workshop shops and mentor facilitators on the best ways to reach their potential as youth workers. Indigeneyez provides healing and confidence-building for Indigenous youth through a creative land-based program that rests on traditional philosophy, values, and indigenous wisdom. Indigeneyez has adapted the Creative Empowerment Model to meet the specific needs of First Nations youth and communities. Power of Hope Canada unleashes the positive potential of youth through arts-centered multicultural and intergenerational learning programs that value self-awareness, leadership, environmental stewardship, community and social change. Power of Hope offers youth camps and school year programs and training for adults in British Columbia. Young Women Empowered (Y-WE) creates social transformation through intergenerational mentorship and creative programs that empower diverse young women to grow their leadership, achieve their future dreams and change our world. Y-WE was co-founded by Partners for Youth Empowerment co-founder Peggy Taylor. 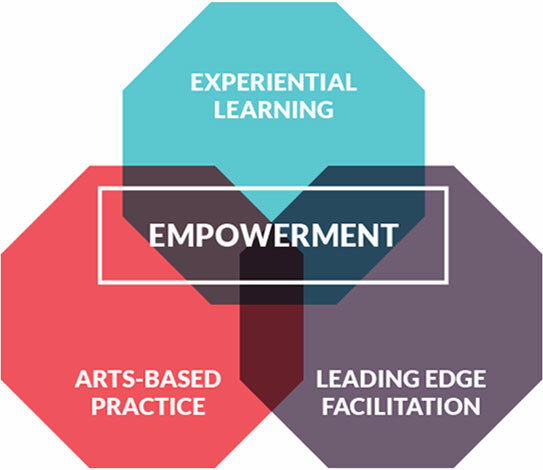 The Creative Empowerment Model is foundational to their program delivery. Arteria runs workshops and camp based on the Creative Empowerment Model, creating educational experiences and camps that help young people, aged 14 to 18, get in touch with their creative potential. ELIX is committed to the personal development of individuals as citizens of the world, through active participation in international voluntary projects. In 2016, Elix began providing Creative Facilitation trainings to their educators and volunteers to support their youth programs and summer camps for children living in refugee camps. Imithayelanga Youth Development works to improve the lives of young people in the most rural areas of South Africa through creative programs and access to education. We work with Imithayelanga to train teachers and youth workers and develop youth support programs and camps in schools and communities. 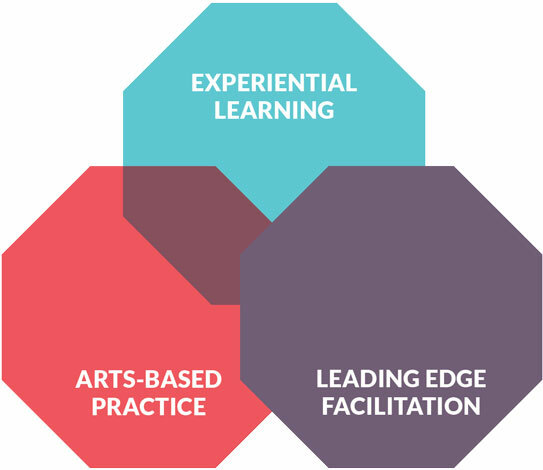 Center for Creative Community at Commonweal explores the intersection of dialogue, cognition, creativity, and community. The center runs a Power of Hope Creative Empowerment Camp and leads Creative Facilitation Trainings for teachers and youth workers in the San Francisco Bay area.